A: No, you do not need to delete the old version. If you have automatic updates on, it will update automatically. If not, you can update it on your own. To do so, tap on the Google Play Store icon, then tap on "My Apps," find the NBC 6 Miami icon and tap "Update." You can also go to the Google Play Store and search for the NBC 6 Miami app and tap "Update." A: On your iPad, tap on your App Store icon, then tap on Updates and find the NBC 6 South Florida icon and tap "Update.” You can also go to the App Store and search for the NBC 6 South Florida app and tap "Update." On your Android device, tap on the Google Play Store icon, then tap on "My Apps," find the NBC 6 South Florida icon and tap "Update." You can also go to the Google Play Store and search for the NBC 6 South Florida app and tap "Update." 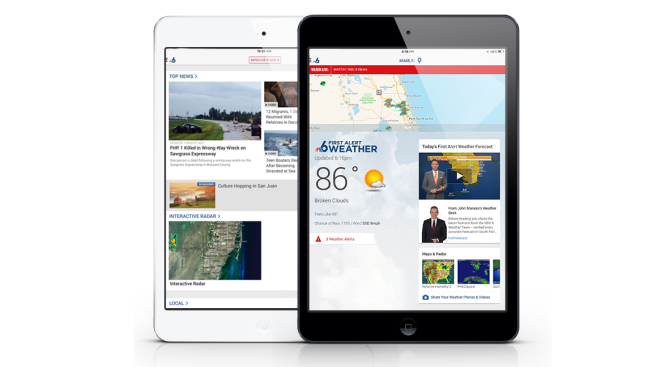 Q: In the App Store, I used to see two different versions of the NBC 6 South Florida app, one for iPhone and one for iPad. Now I only see one. Why is that? Q: When I open my NBC 6 South Florida weather app, I get a message telling me to download the NBC 6 South Florida news app instead. What’s up with that?